Your new MacBook Pro will automatically start up when you open its lid, no sound needed. Apple did away with plenty of popular features in its new MacBook Pro lineup, including SD card support and MagSafe adapters. But a classic, underappreciated attribute, the famous Mac startup chime, also fell on the chopping block. Pingie was the first to notice the change, spotting that instructions on how to reset the new laptop's NVRAM lacked a reference to the startup chime. Pingie's team later said they were able to confirm the change after getting their hands on a new MacBook Pro. 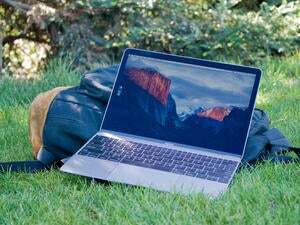 The best guess as to why Apple would do away with the well-known sound is due to the new laptop's automatic startup feature. The Pro is designed to turn on as soon as you open the laptop cover, or when it's connected to an external power source while the lid is open. Why this matters: The startup chime (or Mac boot sound, if you'd prefer) is a piece of Apple history, having been around in its current form since 1999. It's so recognizable that it even made an appearance in Pixar's Wall-E. But Apple has no use for unnecessary nostalgia, as we saw when the iPhone's Slide to Unlock feature unceremoniously died this year. The end of the startup chime is also something of a trend for PCs—Microsoft did away with the sounds in Windows 8. If you're dying to hear that lovely F-sharp major chord every time your MacBook opens, you can apparently still enable it from the terminal. Check out Pingie for the details on how to do this.